Aomame, a feminist assassin, and Tengo, an aspiring author, are bound together by fate within 1984’s alternate reality; 1Q84. In this world their lives become dominated by a cult and the quirky and intoxicating teenager who has escaped it with a story to tell. Murakami’s deadpan writing style insists on minimal descriptions of an unfamiliar environment and is overwhelmed by character’s speech and thought, which is often patronisingly simplistic and repetitive. Disconcerting sexual forays and unrewardingly bizarre fantastic elements make this lengthy, long winded novel an un-enjoyable read. 1Q84’s omnipresent “Little People” simply don’t measure up to Orwell’s “Big Brother”. Woaaa – thanks. Saved me the effort. Your review is just what I imagined it would be like! 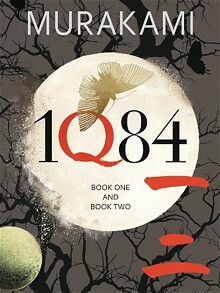 You are currently reading 1Q84 by Haruki Murakami (Book Review) at booksbeccabuys.